The capital of the Khmer kingdom in northwestern Cambodia remains one of the most outstanding legacies of the ancient world. Many have the impression that Angkor Wat is a single temple, when in fact there are more than 40 sites still recognizable to this day. Visitors planning to see the ruins should allow at least three full days to get a good overview. Five days is ideal. 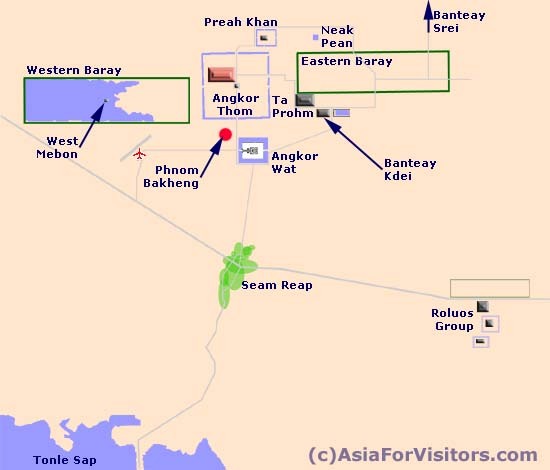 Your base for any visit to the temples will be the modern day town of Siem Reap. It is located just a few miles outside of the temple complex. Most visitors arrive there by air, although road and water transport are also possible. See our page about getting there for more information. See the guidebook page for a couple of recommended books on the temples themselves. The general guides to Cambodia listed will also contain extensive information about the temples.